First things first… most Central Pneumatic air compressors do not include an air hose. This is actually a good thing since most brands that include one, include the cheapest of the cheap. In addition, this increases the price of the compressor. 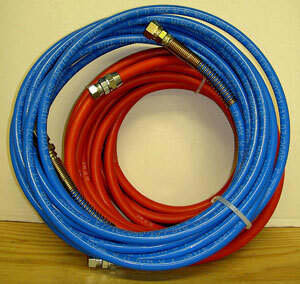 One of the best things you can do is pick out a hose that’s optimal for your use. Rubber has the big advantage in cold weather use where it will stay much more flexible than a polyurethane one. It also feels much sturdier and is super easy to coil and uncoil. The disadvantages are that they are heavier (a lot heavier if using a long 75 or 100 ft hose) and some types of rubber will rub off on your hands. Simply put, if you live in a cooler climate, opt for rubber. Goodyear is the most recommended brand and often considered the best air hose for the money. With polyurethane, the biggest advantage you have is its light weight. If you’re working on a long project such as building a fence or working on the roof, you will most definitely want something light since you’re most likely already using a heavy nailgun or stapler for hours on end. Your arms will thank you. Polyurethane is not as easy to coil back up, has a harder time laying flat on the ground, and can get very stiff when being used in cold temperatures. Some brands, such as Air Pro stay a bit more flexible than others. Because air hoses really don’t cost that much, you’d be best off getting one type of each if you’re the type who uses their compressor more than a couple times a year. Personally, I swear by Goodyear rubber air hoses but I do also have a backup polyurethane which came in handy when I accidentally put a nail into my Goodyear one day (don’t ask! ).